Mix the Cuban Mojo Sauce, mayonnaise, salt and pepper to taste in a medium bowl. Add the cabbage, carrots, pineapple and red bell pepper and toss to lightly coat. Season the flour with cumin and salt and pepper to taste. Dredge the fish in the flour mixture. Shake off excess flour. Heat 2 tablespoon oil in a 10-inch skillet. When hot add the fish. Cook until fish is golden brown on both sides and flaky. Heat remaining oil a little at a time in another skillet. Cook tortillas one at a time until golden brown on both sides. When done place on paper towels to absorb excess oil. 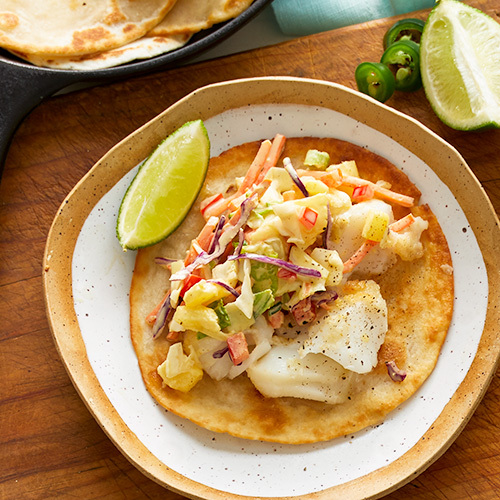 Place flakes of fish on each taco. Top with slaw and garnish with a lime wedge and cilantro leaves.